HESCO, Inc. can laminate a variety of advertising and informational items including business cards, posters, programs, menus, and news articles up to a width of 24 inches. We traditionally use 5 mil laminating rolls to seal items front and back, although other thicknesses for production runs are available upon request. 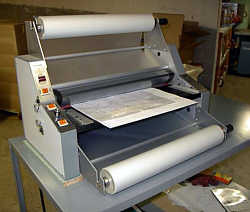 We can also laminate items such as car dealership registration cards in 20 mil, water proof vinyl.